I woke up really excited this morning. While I’m always passionate about the work I do here at Ngamba Island Chimpanzee Sanctuary, there’s something else that’s got me pumped. Today, Tuesday, October 4, 2016, thousands of area residents showing their support for their favorite nonprofit during Great Apes Giving Day. Every donation and donor we get will go further to help us claim our share thousands of dollars in prize money. This is a big event, and everyone is talking about who they’re supporting. Think “American Idol” and we’re in the try-outs but need your support to make it to the top. Follow us on Facebook and Twitter (link to your sites and #greatapesgivingday) and help build the buzz. Help spread the excitement. Tell your friends and family why you think they should help us with their donation. Please be our champion, and help us see it to the top! We can’t wait to celebrate the difference your generosity will make on Tuesday, October 4, 2016. 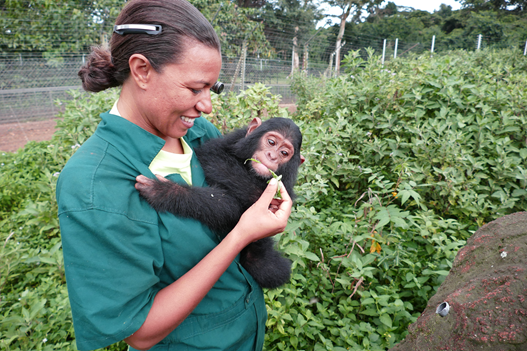 Here is a story of one of the chimps at Ngamba. “My name is Ikuru. I saw my mother die. There was a war in the forests of the Democratic Republic of Congo, that’s where we lived. Gunshots would go off at night and sometimes during day. My mother would always successfully carry me on her back to take me away from the cross fire. But one day we got caught in the middle of the cross fire and my mother tried to move us away as fast as possible but unfortunately she got hit by a stray bullet. I remember hearing her pant hoot, louder and louder followed by whimpering sounds and slowly by slowly her whimpers turned into silence. I looked at her belly and there was a lot of blood. I then tried to touch her eyes and lips but she didn’t move them. I didn’t know where to go so I decided to cling onto her body as she bled to death. A few hours later a UPDF soldier found us and tried to take me away from her but I couldn’t leave her behind. He tried pulling me away from her but I tightened my grip. I just couldn’t leave her behind until he decided to set her ablaze, that’s when I ran away for fear of burning to death. This soldier later took me to Arua district in Uganda where he tried to get papers to raise me as a house pet fortunately I was taken away from him by the clearing officer who stated that I was an endangered specie. I was taken away from him and flown to Entebbe on a chartered plane and later by boat I arrived at Ngamba Island with a bloated stomach, hair loss and majority of my baby teeth had fallen out. I have grown up since then and had my name changed from jungle to Ikuru which means happy one.